Great for running, walking, cycling, traveling, weight lifting, crossfit, baseball, basketball. Compressions will offer stabilization of the calf muscle to reduce pain, swelling, and cramping by increasing circulation and reducing fatigue. You don't have to suffer from shin splints like you used to! - Most of our users have reported better recovery by wearing Compressions for an extended period post workout (during cool down and stretching). 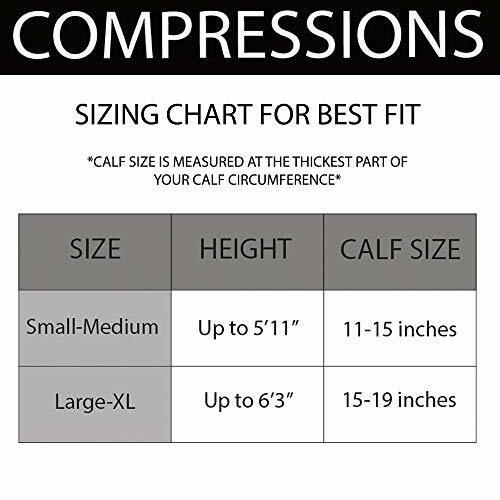 - Compressions are sold in pairs. - The color is black and the size is from 12" to 16" calf circumference. - Our sleeves are made of thin, lightweight, breathable material that is easily washable and retains its elasticity over time. - Not only for athletes, if you work on your feet all day, sit for a long flight, or suffer from restless leg syndrome, wearing Compressions can increase blood flow, providing a more comfortable experience. Most important though, to us, is the customer service you'll receive when you place your order today. All we ask that you give us a shot and if for any reason at all it's not right for you, you have 60 days to let us know and we'll give you 100% of your money back - no questions asked. So order Today by clicking the yellow button at the top right before our special sales price ends!
? SUPPORT YOUR CALVES EFFECTIVELY! - Increase the blood circulation and relieve cases of strain, varicose veins, shin splint and restless leg syndrome. Enjoy full feet movement, with this comfortable and cozy solution by Compressions! ? UNIVERSAL DESIGN! - Thanks to a high quality mixture of 88% nylon and 12% spandex fabric, our pair of socks fits from 12" to 19" calf circumference and due to their supreme elasticity they will remain secure in place! ? EXCELLENT FABRIC QUALITY! 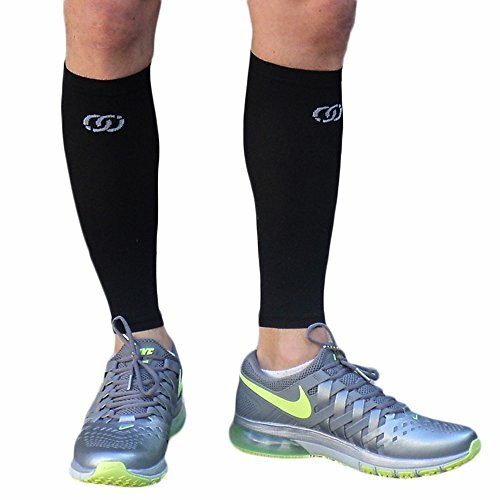 - The nylon/spandex fabric combination is ideal for calf compression sleeves, because it is thin, extremely lightweight and breathable. It is also easily washable and retains its elasticity for a long time! ? MULTI-PURPOSE VALUABLE ACCESSORY! - Our pair of compression socks is excellent support while playing various sports, especially runners, but it is also perfect for reducing calf muscle pains, swelling and cramping by increasing blood circulation and decreasing fatigue! ? 100% MONEY BACK GUARANTEE! 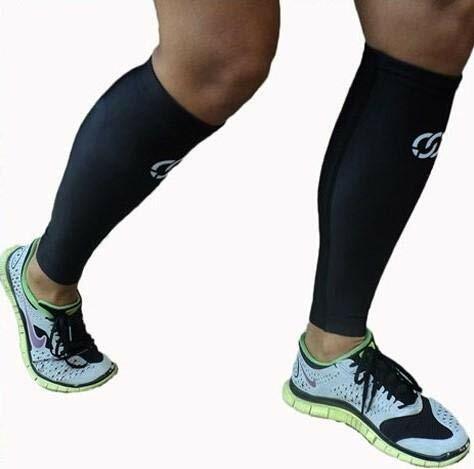 - We are certain that we offer you the best calf compression sleeves your money can buy. But if you aren't perfectly satisfied, don't worry; we will give you your money back - after all, your satisfaction is our ultimate goal!